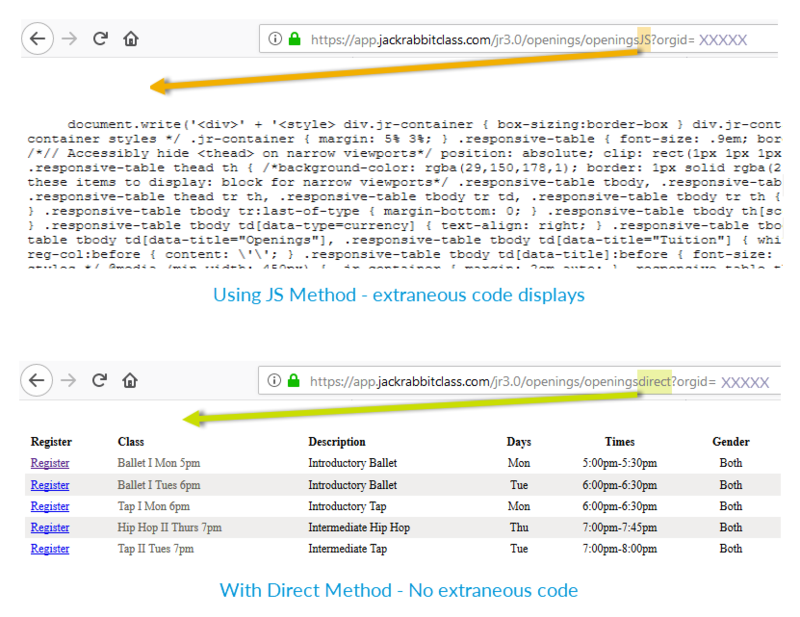 If your webhost does not allow scripting tags (such as <script> ), the following two options may still allow you to use class listings tables. These options are referred to as the "Direct Method". If you can place a link in your webpage, then you can use this "Direct Method". The table won't display directly on your webpage, but instead the link will open a new page with a blank white background with the table located there. You will need a separate link for EACH table you want to make. (Example could be "Click here for all our Tumbling Classes" and another link that is "Click here for all our Ballet classes" etc). You can still use the filtering, hide columns, add columns, and sorting parameters by adding the parameters right after your org id in the html string. The main difference in the direct code given below is the addition of the word 'Direct' in the middle of the url section of the html string. This is necessary to prevent extraneous code from appearing above the table when using as a link. Need assistance? See Integration Assistance page. If you already know how to set-up, code, and use inline frames (iframes), you can use the url in the blue box above as the "src" in an iframe scroll on your own webpage. Jackrabbit does not assist with iframe set-up or troubleshooting. You can find iframe help at www.w3schools.com/tags/tag_iframe.asp. Make sure the word 'Direct' is included in the code as shown above, replace the XXXXXX with your own Org id, and place any custom parameters directly after the last digit of your Org ID. If you attempt to use the JS method in a link or iframe you'll get extraneous code displaying.